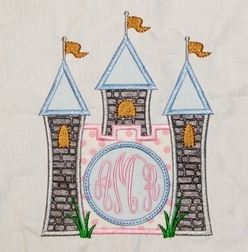 We love this simple and adorable white cotton shirt with the fabulous Cinderella's princess castle appliqued on the front! We found this adorable monogram frame and knew it was just perfect for Cinderella and princess lovers, a princess party and of course visits to the Disney parks. The castle towers are made with fabric resembling real grayish stones that a castle would naturally be made of. The castle has three towers, each with a turret and a golden flag flying in the wind. 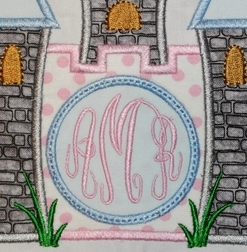 In the middle of the castle is a round space made just for your little girl's initials monogram! 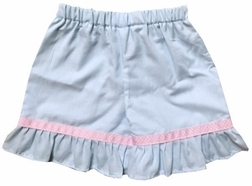 To complete the outfit, we pair the shirt with blue shorts or capris that have pink with white dots ribbon trim.